As the patent battle between Apple and Samsung continues to rumble on, we have been made privy to information that both companies have fought hard to keep a secret. Apple VPs Phil Schiller and Scott Forstall have already testified on the creation, sales and hardships of iPhone project, also providing some fresh insight into how highly Steve Jobs regarded patents registered by the company. NetworkWorld pored through comments made by Senior VP of iOS software Scott Forstall, where he explained the importance of Apple’s ‘381, ‘915 and ‘163 patents, which are all currently being asserted against Samsung in a Californian District Court. Forstall explained his delight at being able to create an iPhone that utilised pinch-to-zoom (the ‘163 patent on which he is listed as an inventor), he also detailed Steve Jobs’ close connection to Apple’s ‘381 patent — a technology that covers the “rubber band” (or inertial scrolling) effect that occurs when a user attempts to scroll past the end of a displayed document or webpage. Jobs’ affinity for the inertial scrolling has been demonstrated over the years. In 2010, he told attendees at an AllThingsD conference about the rubber band effect and how it had spurred the creation of the iPhone. The Apple co-founder was also reported to have entered negotiations with Samsung in the same year, where he identified the patents that the Korean company was allegedly infringing upon and invited them to work out a deal, prior to the lawsuits we are witnessing today. The Apple VP also underlined the importance of the feature to Steve Jobs: “Rubber banding is one of the sort of key things for the fluidity of the iPhone and – and all of iOS, and so I know it was one of the ones that Steve really cared about. “I actually think that Android had not done rubber banding at some point and it was actually added later. So they actually went form sort of, you know, not yet copying and infringing to – to choosing to copy, which is sad and distasteful,” Forstall added. While Apple is associated with playing hardball over its patents, it emerged late last year that Apple had licensed its inertial scrolling (‘381) patent to both Nokia and IBM, the former as a result of a settlement that saw Apple cross-license technologies with the Finnish mobile giant. It also offered Samsung a chance to license the patent, but it declined. I’ll start off by saying that Jobs may have been particularly fond of lots of other patents. However, Forstall’s recent comments detail his connection with the ‘381 patent. Now, if you view the registration document for the ‘381 patent, you will notice that it lists a Bas Ording as its inventor. Ording is also credited with inventing the dock magnification (user interface for providing consolidation and access) we see in Mac OS X, and he is still working at Apple today. How is this connected to Steve Jobs? The process could be intimidating, but Jobs had an eye for talent. When they were looking for people to design the graphical interface for Apple’s new operating system, Jobs got an email from a young man and invited him in. The applicant was nervous, and the meeting did not go well. Later that day Jobs bumped into him, dejected, sitting in the lobby. The guy asked if he could just show him one of his ideas, so Jobs looked over his shoulder and saw a little demo, using Adobe Director, of a way to fit more icons in the dock at the bottom of a screen. When the guy moved the cursor over the icons crammed into the dock, the cursor mimicked a magnifying glass and made each icon balloon bigger. 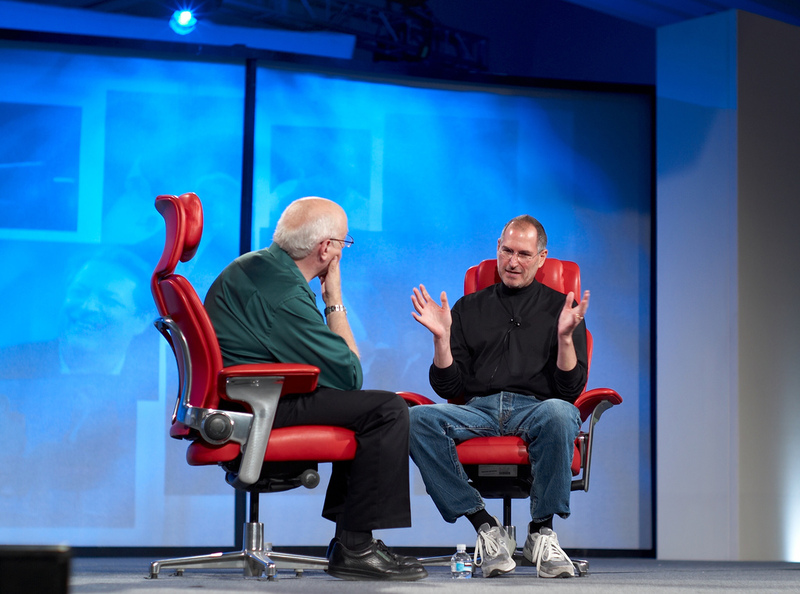 “I said, ‘My God,’ and hired him on the spot,” Jobs recalled. The feature became a lovable part of Mac OS X, and the designer went on to design such things as inertial scrolling for multi-touch screens (the delightful feature that makes the screen keep gliding for a moment after you’ve finished swiping). That young designer was Bas Ording. Jobs, impressed by Ording’s dock magnification technique, brought him into the company, where he went on to create the scrolling patent that is being contested today. The Dutch designer holds the position of User Interface Designer at Apple and has been at the company for 14 years. It would be a huge leap of faith to link Jobs to the creation of inertial scrolling, but his actions in 1998 (when Ording was hired) certainly facilitated its development. Apple accuses Samsung of infringing on its ‘381 patent, but also ‘915, patent, ‘D677 design patent, ‘983 registered trade dress, ‘163 patent, ‘D087, ‘D305, and ‘D889 design patents. The case is still ongoing. Earlier today, documents became available breaking down how Apple arrived at its $2.5 billion damages assessment. The figures appear in a Summary of Apple’s Damages Calculations exhibit prepared by accounting consulting firm Invotex Group, which specializes in calculating royalty rates for litigation. The document outlines four damage scenarios, ranging from $2.47 billion to $2.88 billion, depending on whether Apple’s lost profits are counted and which patents are included.